The government is currently considering proposals for a reform of the UK’s libel laws. 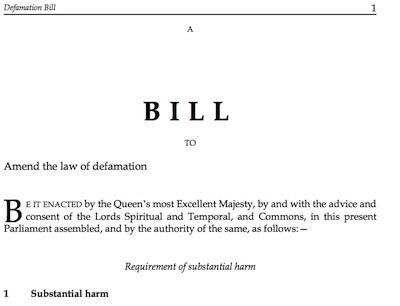 A draft bill has been published which would introduce new provisions for defences of “Responsible publication on matter of public interest” and “Honest opinion” on a matter of public interest which could be used by those responding to charges of defamation. It would also introduce the concept that only statements likely to cause substantial harm to the reputation of the claimant would be considered defamatory. I support these changes as I think they have the potential to reduce the threat of libel actions over those involved in engaging with the democratic process or acting as democratic representatives as well as offer protection to journalists, scientists, and indeed anyone who wants to speak up and try and make the world a better place. In many ways the proposals are bringing our currently rather bonkers, and open to abuse, libel law, in line with common sense. The proposals also include amending and clarifying the list of things one can publish without any threat of libel action. Items currently on the list include “fair and accurate report of proceedings in public before a court” as well as the proceedings of Parliament and other legislatures. The draft bill proposes adding, for example, a “report of proceedings of a scientific or academic conference”, to the list of material one can freely publish. Giving protection to those publishing material released by public bodies (eg. FOI responses). Preventing libel action being taken merely on the basis that a web-link to defamatory material was published. Extending the principle that any governmental body should be open to uninhibited public criticism, and therefore should not be able to use or threaten use defamation law to quash its critics, to all public bodies and those acting on their behalf. Thanks to your fantastic use of Twitter I know you’re preparing to play your part in the Draft Libel Reform Bill Committee and the reform of our libel laws. Clause 5 of the draft bill you are considering proposes amending and clarifying the types of material which can be published without fear of being sued for defamation. The exempt types of material are listed in Schedule 1 to the Defamation Act 1996 and the current draft bill proposes making changes to that list. I would like to propose adding a further clear special exemption applying to material released by public bodies. I would suggest this use the form of words which appear elsewhere in the Bill and cover a “fair and accurate report or summary of, copy of or extract from…”. The new provision I am proposing would enable the republication of Freedom of Information responses from public bodies without fear of libel action. Such a provision would clearly be of value to services such as the mySociety’s Freedom of Information website WhatDoTheyKnow.com which allows people to make request for information in public and ensures the request, correspondence and response are automatically published online. It would also allow campaigners, journalists and others working with such material more freedom from legal threats and uncertainty; as such I think this addition would be in-line with the coalition’s stated aims of these amendments to libel law. I do not think any new provision ought be limited to information released under the “Freedom of Information Act”, as there is a range of access to information legislation, and information proactively released by public bodies ought also be covered. The definition of public bodies used could though be based on as those covered by the Freedom of Information and Environmental Information Regulations; you might want to consider including those bodies which despite having substantial public roles are not subject to the FOI Act and bodies carrying out work on behalf of the public sector (who ought be covered in relation to that work). This is a simple but important change. It could be seen as almost a clarification of the existing legal position (“matter published by or on the authority of a government or legislature anywhere in the world” is already covered), but I would rather see Parliament explicitly clarify the law rather than see a journalist, campaigner or website operator be subjected to expensive and time consuming legal action. My view is the principle that any governmental body should be open to uninhibited public criticism, and therefore should not be able to use or threaten use defamation law to quash its critics ought be extended to apply to all public bodies, again this could use the definition of public bodies as applies with FOI/EIR legislation. Such a provision could be seen as a mere clarification of the current position; my view it would be desirable to see the current uncertainty over how widely the “Derbyshire Principle” applies clarified by Parliament and not left to a court. Where senior officers in an organisation are to all intents and purposes acting on behalf of (and perhaps even funded by) the public body they too ought in my view be covered. This bill could be usefully used to add a provision providing a defence for those publishing weblinks to defamatory content who are acting in good faith and who have not endorsed the content they have linked to. The law should be clarified to ensure posting links for example in search engine results pages, or of the form “See another point of view at: [URL]” or “a related article is at: [URL]” would not be actionable in cases where there is no intent to defame. I volunteer for mySociety and am one of the team responsible for administering the WhatDoTheyKnow.com website and responding to requests to take material down, my comments here largely derive from my experience in that role. WhatDoTheyKnow.com has responded to the Ministry of Justice consultation on the the draft bill, in that response it expands on the suggestions I have made here. I am not seeking a reply. P.S. I’d also like the law to ensure that definitions of “defamation” used by educational institutions in their internal disciplinary proceedings follow the national legal position (eg. allowing a defence to a charge of defamation (eg. truth) to be made, rather than permitting them to ban defamation outright). I don’t think this bill is the place for such a provision – that’s one for a revamp of the Education Act, which I would like to see more generally give much stronger protection to students trying to improve their institutions. This entry was tagged Julian Huppert, Parliament on April 4, 2011 by Richard Taylor. Private Eye has this week published a ‘Libel Special’ of its Rotten Boroughs section. It gives three examples of where libel actions have been used effectively by local councils (sometimes funded by taxpayers) to try and silence those entering into local political debate. It points out the Local Authorities (Indemnities for members and officers) order 2004 which ought prevent taxpayers funds from being used to fund libel actions taken out by individuals (as the councils themselves can’t do so following the Derbyshire v Sunday Times ruling). The relevant bit of the order is section 6(3). This clearly isn’t strong enough and as I suggested in my second “other suggestion” in the above article I hope the libel reforms currently going through Parliament sort this out.